Somewhere under the rainbow! Scuba divers in Minnesota set to go looking for Judy Garland (Wizard of Oz) ruby slippers in a mine pit! The search and rescue dive will take place next week in Minnesota. I received a press release last week from the organizers of the 40th Annual "Wizard of Oz" Festival June 10-13 near Grand Rapids Minnesota. An homage to both the singer / actress and her break-out movie, the big event this weekend will take place underwater. 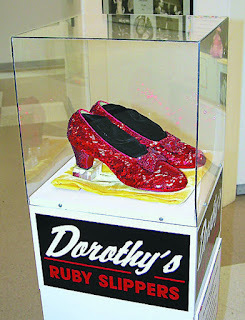 "Scuba divers for the Judy Garland Museum will take a plunge into the Tioga Mine Pit June 11, and June 12 at 10 a.m., and 1 p.m. to explore decade-old rumors a pair of authentic ruby slippers – worn by Judy Garland as Dorothy – were discarded there after a brazen 2005 heist," reads the press release. The Itasca County Sheriff's Dive Team will go to great depths in its search for the iconic red shoes following a famous theft that remains unsolved. "These rumors have been floating around since it happened," says Jonny Miner, one of the founders of the popular museum which includes Judy Garland's childhood home, "and we're finally putting them to the ultimate test." There is a Canadian connection at the weekend event. Toronto based Tricon Films and Television is shooting live footage of the underwater search for an upcoming documentary "The Slippers." "The ruby slippers are an indelible piece of cinematic history and pop culture, and it is an honor to be able to capture this historic event for my film," said Producer/Director Morgan White.